In general, you may visit this website without identifying yourself or revealing any personal information. Give Back Yoga may collect aggregate domain information from your visit to customize and improve your experience on our website. Some portions of this website may require you to submit personal information such as your name, e-mail, or other address in order to provide you with information or services. If you opt to provide us this information, we also may use it for purposes such as verifying your identity, sending you information or contacting you. We will not make your information available to our business partners for marketing or other purposes. Give Back Yoga does not sell or share with third parties any information submitted by community members who visit our website. We communicate by email with community members who download free materials, purchase a product, make a donation or sign up for our mailing list. If at any time you would like to be removed from our email list, please click the “Unsubscribe” link at the bottom of an email or send your request to info@givebackyoga.org. Give Back Yoga aims to ship physical products within 5 business days for standard orders, and within one business day for priority orders. To inquire about your shipping status, you may contact info@givebackyoga.org. Give Back Yoga ships products worldwide. Domestic shipping rates apply for the US and APO/FPO addresses; international shipping rates apply for the rest of the world. For questions, please email info@givebackyoga.org. Give Back Yoga offers multiple shipping options. Rates below are as of January 2017. These rates are subject to change and special shipping and handling charges may apply. Special charges may apply for items shipped directly from the manufacturer, or for bulky items. The current shipping rate for bulk orders of practice guides is $9.00 per box, available only through standard shipping. Special charges may apply for items shipped directly from the manufacturer, or for bulky items. The current shipping rate for bulk orders of practice guides is $45.00 per box, available only through standard shipping. Give Back Yoga strives to ensure that each community member has a good experience with our non profit organization. Should your item arrive damaged or not as expected, please contact [email protected] so that we can evaluate your concern on a case-by-case basis. Possible resolutions may include a full or partial refund, or the shipment of a replacement product or one of equivalent value. If you need to change an order or have mistakenly submitted a duplicate transaction, please contact [email protected] immediately so that Give Back Yoga staff members can research and resolve the issue as soon as possible. If a duplicate product order has already shipped, we may request that you show proof of return shipping before processing your refund. Please allow up to 30 days from the date of your initial inquiry for funds to appear back in your account. Any handling charge assessed by our payment processor may be deducted your refund. Refund policies for live events and trainings are set by each event host and/or program director. If you are not able to attend an event or training for which you have already registered through the Give Back Yoga site, please contact us immediately at [email protected] so that we can work with the host to determine whether a refund is available or if you may be able to transfer your registration to another upcoming event. Give Back Yoga strives to offer high-quality training opportunities to those who wish to share this mind-body practice with specific populations. If you find a training is not as expected, please contact us at [email protected] so that we can evaluate your situation on an individual basis and identify an appropriate resolution. Refunds of donations and membership fees may be available for up to 30 days from the transaction date. 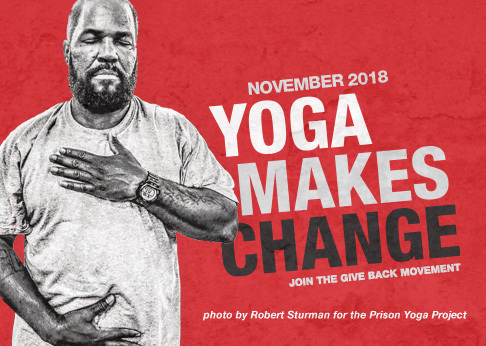 If you have mistakenly submitted a unintended donation amount, please contact [email protected]immediately so that Give Back Yoga staff members can resolve the issue. Please allow up to 30 days from the date of your initial inquiry for funds to appear back in your account. Any handling charge assessed by our payment processor may be deducted your refund. The Information is provided with RESTRICTED RIGHTS. Use, duplication, or disclosure by the government is subject to restrictions as set forth in subparagraph (c)(1)(ii) of the Rights in Technical Data and Computer Software clause at DFARS 252.227-7013 and subparagraphs (a) through (d) of the Commercial Computer Software-Restricted Rights clause at FAR 52.227-19, or its successor provision(s), as applicable. Contractor/manufacturer is Give Back Yoga Foundation – 900 Baseline Road, Cottage 13B, Boulder, CO 80302-7547. The Give Back Yoga Foundation logo, brand and product names referenced herein are trademarks of Give Back Yoga Foundation. All other brand and product names mentioned herein are trademarks of their respective owners. This website contains hyperlinks to Web sites controlled by third parties. Give Back Yoga Foundation is not responsible for, and does not endorse the contents or use of, these Web sites. © 2015 Give Back Yoga Foundation – All rights reserved. The copyright in this website and the material on this website (including without limitation the text, computer code, artwork, photographs, images, music, audio material, video material and audio-visual material on this website) is owned by Give Back Yoga Foundation. Any product, process, or technology published on this site may be the subject of intellectual property rights reserved by Give Back Yoga Foundation, its subsidiaries, or licensors and are not licensed hereunder.